"The Story of the Stone" redirects here. For Barry Hughart's fantasy novel on ancient China, see The Story of the Stone (Barry Hughart). Dream of the Red Chamber, The Red Chamber Dreams or A Dream of Red Mansions (红楼梦Hónglóu mèng), also known as The Story of the Stone (石头记Shítóu jì) is one of the masterpieces of Chinese fiction and one of the Chinese Four Great Classical Novels. It was composed sometime in the middle of the 18th century during the Qing Dynasty. It is attributed to Cáo Xuěqín (Cao Zhan). The novel is believed to be semi-autobiographical, mirroring the fortunes of Cao's own family. As the author details in the first chapter, it is intended to be a memorial to the women he knew in his youth: friends, relatives and servants. 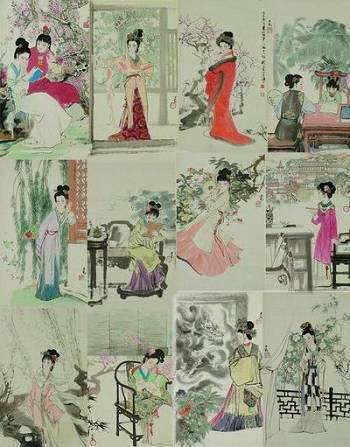 The novel is remarkable not only for its huge cast of characters (most of them female) and psychological scope, but also for its precise and detailed observation of the life and social structures typical of 18th-century Chinese aristocracy. A scene from the story, painted by Xu Bao (born 1810). Other scenes.The novel provides a detailed, episodic record of the two branches of the Jia Clan, the Ning-guo and Rong-guo Houses, who reside in two large adjacent family compounds in the capital. Their ancestors were made Dukes, and as the novel begins the two houses remain among the most illustrious families in the capital. The novel describes the Jias' wealth and influence in great naturalistic detail, and charts the Jias' fall from the height of their prestige, following some thirty main characters and over four hundred minor ones. Eventually the Jia Clan falls into disfavor with the Emperor, and their mansions are raided and confiscated. The story's preface has supernatural Taoist and Buddhist overtones. A sentient Stone, abandoned by the Goddess Nüwa when she mended the heavens aeons ago, begs a Taoist priest and Buddhist monk to bring it to see the world, falls in love with a Crimson Pearl Flower, and then enters the mortal realm. The main character, Jia Baoyu, is the adolescent heir of the family, possibly a reincarnation of the Stone (although in the most reliable Jiaxu manuscript the Stone and Jia Baoyu are separate while related). The Crimson Pearl Flower is incarnated now as Baoyu's sickly cousin, the emotional Lin Daiyu. Baoyu is predestined in this life to marry another cousin, Xue Baochai. This love triangle against the backdro of the family's declining fortunes forms the most well-known plot line in the novel. The name of the main family, "贾" is pronunced the same in Mandarin as "假" which means false, fake, fictitious, deceitful or sham. Thus Cao Xueqin (曹雪芹) suggests that the novel's family is a "dream" version of his family that is a mixture of real and fake story telling. Baoyu (宝玉) occasionally dreams of another Baoyu, whose surname is "甄", which puns on "真" (real, true). The novel is normally called Hong Lou Meng or Hung Lou Meng (红楼梦), literally "Red Mansion Dream." "Red Mansion" was an idiom for the sheltered chambers wher the daughters of wealthy families lived. It can also be understood as referring to a dream that Baoyu has, set in a "Red Mansion," wher the fates of many of the female characters are foreshadowed. "Red" also suggests the Buddhist idea that the whole world is "red dust" (红尘), merely illusory and to be shunned. Thus the novel fits in perfectly with Buddhist (佛) and Taoist (道) beliefs that to find enlightenment, one must realize that the world is but a dream from which we must awake. Jia Baoyu (贾宝玉): the main protagonist. The adolescent son of Jia Zheng (贾政) and his wife, Lady Wang (王夫人). Born with a piece of luminescent jade in his mouth, Baoyu is the heir apparent to the Rongguo line (荣国府). Frowned on by his strict Confucian father, Baoyu prefers reading novels and casual literature to the Four Books basic to a classical Chinese education. Baoyu is highly intelligent, but hates the fawning bureaucrats that frequent his father's house. He shuns most men, considering them morally and spiritually inferior to women. Sensitive and compassionate, Baoyu holds the view that "girls are in essence pure as water, and men are in essence muddled as mud." Baoyu's distaste for worldly affairs and his frustrated love for his cousin Daiyu (黛玉) eventually cause him to become a Buddhist monk. Lin Daiyu (林黛玉): Jia Baoyu's first cousin and love interest. She is the daughter of Lin Ruhai (林如海), a Yangzhou scholar-official, and Lady Jia Min (贾敏), Baoyu's paternal aunt. The novel proper starts in Chapter 3 with Daiyu's arrival at the Rongguo house (荣国府) shortly after the death of her mother. Beautiful but fragile emotionally, prone to fits of jealousy, Daiyu is nevertheless an extremely accomplished poet and musician. The novel designates her one of the "Twelve Beauties of Jinling," and describes her as a lonely, proud and ultimately tragic figure. Daiyu is the reincarnation of the Crimson Pearl Flower, and the purpose of her mortal birth is to repay her divine nurturer, reborn as Baoyu, her "debt of tears". Xue Baochai (薛宝钗): Jia Baoyu's other first cousin. The only daughter of Aunt Xue (薛姨媽), sister to Baoyu's mother, Baochai is a foil to Daiyu. wher Daiyu is unconventional and hypersensitive, Baochai is sensible, tactful and a favorite of the Jia household; a model Chinese feudal maiden. The novel describes her as a beautiful and intelligent girl, but also very reserved. Although reluctant to show the extent of her knowledge, Baochai seems to be quite learned about everything, from Buddhist teachings to how not to make a paint plate crack. Also one of the "Twelve Beauties in Jinling," Baochai has a round face, fair skin, and, some would say, a voluptuous figure in contrast to Daiyu's willowy daintiness. Baochai carries a golden locket with her which contains words given to her in childhood by a Buddhist monk. Baochai's golden locket and Baoyu's jade contain inscriptions that appear to complement one another perfectly; their marriage is seen in the book as predestined. Jia Yuanchun (贾元春): Baoyu's elder sister by about a decade. Originally one of the ladies-in-waiting in the imperial palace, Yuanchun later becomes an Imperial Consort, having impressed the Emperor with her virtue and learning. Her illustrious position as a favorite of the Emperor marks the height of the Jia family's powers. Despite her prestigious position, Yuanchun feels imprisoned within the four walls of the imperial palace. Eventually Yuanchun's sudden death precipitates the fall of the Jia family. Included in Jinling City's Twelve Beauties. Jia Tanchun (贾探春): Baoyu's younger half-sister, by Concubine Zhao, second wife to Jia Zheng. Brash and extremely outspoken, she is almost as capable as Wang Xifeng. Wang Xifeng herself compliments her privately, but laments that she was "born in the wrong womb," since concubine children are not respected as much as those by first wives. Tanchun is nicknamed "Rose" forher beauty and her prickly personality. Shi Xiangyun (史湘云): Jia Baoyu's second cousin, Grandmother Jia's grand-niece. Orphaned in infancy, she grows up under her wealthy maternal uncle and aunt who use her unkindly. In spite of this Xiangyun is openhearted and cheerful. A comparatively androgynous beauty, Xiangyun looks good in men's clothes, and loves to drink and eat meat (considered masculine). She is forthright without tact, but her forgiving nature takes the sting from her casually truthful remarks. She is learned and as talented a poet as Daiyu or Baochai. She is also one of Jinling City's Twelve Beauties. Wang Xifeng (王熙凤), alias Sister Feng (凤姐) - Baoyu's elder Cousin-in-law, young wife to Jia Lian (who is Baoyu's paternal first cousin), niece to Lady Wang. Xifeng is hence related to Baoyu both by blood and marriage. An extremely handsome woman, Xifeng is capable, clever, amusing and at times, vicious and cruel. Undeniably the most worldly of the women in the novel, Xifeng is in charge of the daily running of the Rongguo household and wields remarkable economic as well as political power within the family. Being a favorite niece of Lady Wang, Xifeng keeps both Lady Wang and Grandmother Jia entertained with her constant jokes and amusing chatter, plays the role of the perfect filial daughter-in-law, and by pleasing Grandmother Jia, rules the entire household with an iron fist. One of the most remarkable multi-faceted personalities in the novel, Xifeng can be kind-hearted toward the poor and helpless. On the other hand, however, Xifeng can be cruel enough to kill. Her feisty personality, her loud laugh and her great beauty formed refreshing contrasts to the many frail, weak-willed beauties that plagued the literature of 18th-century China. Xifeng's name translates to "the Phoenix" - a mythical bird of authority. She is also one of Jinling City's Twelve Beauties. The names of the maids and bondservants are given in the original pinyin and in David Hawkes' translation. Ping'er (平儿, Patience) - Xifeng's chief maid and personal confidante; also concubine to Xifeng's husband, Jia Lian. The consensus among the novel's characters seem to be that Ping'er is beautiful enough to rival the mistresses in the house. Originally Xifeng's maid in the Wang household, she follows Xifeng as part of her "dowry" when Xifeng marries into the Jia household. She handles her troubles with grace, assists Xifeng capably and appears to have the respect of most of the household servants. She is also one of the very few people who can get close to Xifeng. She wields considerable power in the house as Xifeng's most trusted assistant, but uses her power sparingly and justly. Xiren (袭人, "Invading Fragrance", Aroma) - Baoyu's principle maid and his unofficial concubine. Originally the maid of the Dowager, Xiren was given to Baoyu because of her extreme loyalty toward the master she serves. Considerate and forever worrisome over Baoyu, she is the partner of his first adolescent sexual encounter during the early chapters of the novel. Qingwen (晴雯, Skybright) - Baoyu's other handmaiden. Brash, haughty and the most beautiful maid in the household, Qingwen is said to resemble Daiyu very strongly. Of all of Baoyu's maids, she is the only one who dares to argue with Baoyu when reprimanded, but is also extremely devoted to him. She was disdainful of Xiren's attempt to use her sexual relation with Baoyu to raise her status in the family. Lady Wang later suspected her of having an affair with Baoyu and publicly dismissed her on that account; angry at the unfair treatment and of the indignities and slanders that attended her as a result, Qingwen died shortly of an illness after leaving the Jia household. The textual problems of the novel are extremely complex and have been the subject of much critical scrutiny, debate and conjecture in modern times. Cao did not live to publish his novel, and only hand-copied manuscripts survived after his death until 1791, when the first printed version was published. This printed version, known as the Chenggao edition, contains edits and revisions not authorised by the author. The novel, published up till the 20th century, was anonymous. Since the twentieth century, after Hu Shi's analyses, it is generally agreed Cao Xueqin wrote the first 80 chapters of the novel. Up until 1791, the novel circulated merely in scribal transcripts. These early hand-copied versions end abruptly at the latest at the 80th chapter. The earlier ones furthermore contain transcribed comments and annotations from unknown commentators in red ink. These commentators' remarks reveal much about the author in person, and it is now believed some may even be members of Cao Xueqin's own family. The most prominent commentator is Rouge Inkstone (胭脂斋), who revealed much of the interior structuring of the work and the original MS ending, now lost. These MS are the most textually reliable versions, known amongst scholars as "Rouge versions" (脂本). Even amongst the some 11 independent surviving manuscripts, small differences in some characters used, rearrangements and possible rewritings made the texts vary a little from another. According to novel's first chapter, Cao Xueqin revised his novel five times and died before he had finished the fifth version. To compound this problem, parts of the latter chapters of the book were lost, so we only have 80 chapters that are definitively written by the author. The early 80 chapters brim with prophecies and dramatic foreshadowings which also give hints as to how the book would continue. For example, it is obvious that Lin Daiyu will eventually die in the course of the novel; that Baoyu and Baochai will marry; that Baoyu will become a monk; various characters will suffer in the snow; and that the whole estate will finally be consumed by flames. Most modern critical editions have the first 80 chapters based on the Rouge versions.